Click here to learn how local artists re-purposed the wood of a 150 year old tree that Cicoria Tree Service removed from The First Church in Salem. Join us at the Liberty Tree Mall at Touch a Truck- to benefit the Simon Youth Foundation! The Liberty Tree Mall is hosting a Touch a Truck event again on Saturday, June 17 from 10:00- 1:00. You can check out safety vehicles, rigs, wreckers, and cool cars at this kid-friendly, fun-filled event. 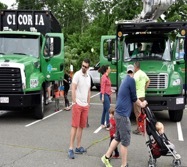 Cicoria Tree Service will have 2 of our trucks there for you to see. The event is free to attend. A $5 suggested donation to benefit the Simon Youth Foundation is greatly appreciated. We are pleased to announce that on November 4, 2015, Cicoria Tree & Crane Service, Inc. was awarded Accreditation from the Tree Care Industry Association. 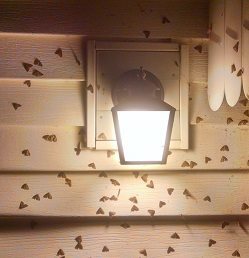 No doubt if you live on Boston's North Shore you've seen the brown moths swarming headlights and outside lights at dusk. This many moths in the Fall translates to overwhelming numbers of winter moth caterpillars feeding on your trees in the Spring. Add to this the aggressive resurgence of Gypsy Moth Caterpillars in many of our towns, and the chances of severe defoliation, tree decline and possible death increase dramatically. Application timing to suppress these destructive pests next Spring is critical. Your trees need to be treated before too much foliage is lost from feeding. Do not wait until next Spring to act. If you are not already signed up for a treatment, please take the time to call the office now to schedule a free tree inspection and estimate to preserve your valuable trees and shrubs. If you have had your trees treated by Cicoria in the past, you will be receiving a proposal for this work soon. Please sign and return your proposal or contact the office at (978) 922-5500 or via email at info@cicoriatree.com to insure that you are scheduled for treatment. Gypsy Moth and Winter Moth lay their eggs everywhere: wood piles, trailers, boats and boat covers, outdoor furniture, pool equipment, ATVs, car frames, tire wells, the list goes on. Can you see how easy it would be to inadvertently move these and other new invasive species to a new un-infested location? Emerald Ash Borers were recently discovered in North Andover. Essex County is now under a Federal Quarantine which regulates the movement of firewood and tree products. No firewood is to be moved out of Essex County. Please do your part to limit the spread of invasive insects and diseases. Do not move firewood more than 10 miles. If you're going camping or on vacation, do not take wood with you. Buy your wood when you get there. 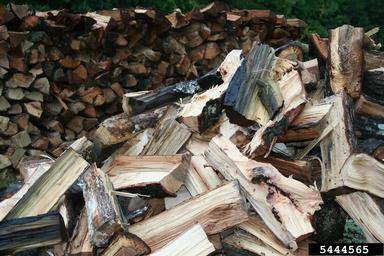 Many states now list local firewood vendors on their forest department websites. Do not bring the wood you buy back home. Before you take a trip, take a minute to check your car, trailer, boat, etc. to make sure you're not giving Gypsy Moth eggs a free ride. Tell your friends and encourage them to do the same. For more information on invasives, the damage they do, controlling the spread and so on, please contact us or check out the links below. Winter Moth Caterpillars are coming to eat your trees- again! Late last fall the evening air was thick with brown moths- the adult male winter moth looking to mate with the flightless females. They covered the walls by back door lights, tried to get into the house and swarmed around car headlights. After mating with the pesky males, the female moth laid her eggs on trees, in bark crevices, rocks, leaf litter or wherever she happened to be. Early spring, right about now, the eggs are starting to hatch. Tiny caterpillars emerge, and after spinning a small silk strand, become air-bouyant. Carried up by air currents into the tree’s canopy, they weasel their way into leaf buds and start feeding- voraciously! These caterpillars can easily eat enough leaves to negatively affect a tree’s health for years to come. They feed on all maples, oaks, apples, blueberries, crabapples elm, ash, and the list goes on. In addition, their droppings, excrement, quickly accumulates on your car, your deck, outdoor furniture and patios, staining surfaces and creating a mess. The trick to getting good control of these nuisance caterpillars is choosing a safe, effective material and being on time to treat. The treatment window is narrow. Timing is critical, so schedule now. Here at Cicoria we use a bio-rational material called “Conserve” The active ingredient is spinosad, an organically based compound. Our equipment is modern, safe and efficient. Our applicators are certified and specially trained to ensure your safety and satisfaction. Please contact us if you wish to schedule this service or have any questions about winter moth or anything else about trees and tree care. We’re the professionals! My compliments to your expert team. Great service from start to finish. — Janet.